Crystal Deva are the conscious beings found within crystals and stones. Crystal Deva are a manifestation of universal healing energy. 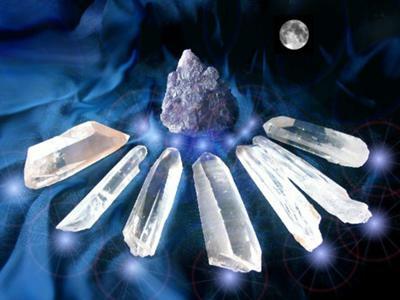 It is the Deva or crystal beings which allow us to receive information and healing energy from the crystal structure. The Crystal Deva determine the healing properties of each stone as a unique entity (i.e. your individual Amethyst crystal) as well as the healing properties attributed to the general type of stone (i.e. all Amethyst crystals). To awaken the elemental (the spirit or Deva within the crystal), you should dedicate the stone with love and light for the good of all beings in the universe. By doing this, you are making a contract with the crystal Deva to use the crystal for healing yourself and others. Then, just graciously receive the magnificent gift of energy given off by the crystal. Since crystals readily absorb energy, it is important to charge them with positive energy after removing negativity through cleansing. Each method of charging adds its own energetic imprint to the crystal, so you should decide which type of energy you would like to work with and then charge your stone using a corresponding method. SEEDS: Place your crystal in a container (preferably glass) filled with seeds (any type will do, but specific types will carry the energy of that plant) and leave it there overnight. It is best to completely cover the stone with the seeds. This method of charging is connected with the property of growth and with spring season energy and the earth element. FLOWERS: Place your crystal in a container (preferably glass) filled with flowers (any type will do, but specific types will carry the energy of that plant) and leave it there overnight. It is best to completely cover the stone with the flowers. This method of charging is connected with the properties of fertility and completion and with summer season energy and the earth element. SNOW: Place your crystal in a container (preferably glass) filled with snow and leave it there overnight. It is best to completely cover the stone with the snow. This method of charging is connected with the properties of peace and calming and with winter season energy and with the air element. Use caution with the above method as the cold of the snow may crack your crystal. LEAVES (FRESH OR DRIED): Place your crystal in a container (preferably glass) filled with leaves (any type will do, but specific types will carry the energy of that plant) and leave it there overnight. It is best to completely cover the stone with the leaves. When using fresh leaves, this method of charging is connected with the property of new beginnings and with spring season energy and the earth element. When using dried leaves, this method of charging is connected with solitude and with autumn season energy and the earth element. An alternative method of this charging technique is to place your crystals in with a potted houseplant overnight. NEW MOONLIGHT: Place your crystal outdoors or on the windowsill and leave it in the moonlight for one full day (24 hours) or for one full moon cycle. This method of charging is connected with new beginnings and with the water element. This method works particularly for feminine-energy stones. It is preferable to place crystals outside on the ground (where they have direct contact with the earth), but if this is not possible, a windowsill is also acceptable. WAXING MOONLIGHT: Place your crystal outdoors or on the windowsill and leave it in the moonlight for one full day (24 hours). This method of charging brings positive energy into the stone. It is connected with the water element. It is preferable to place crystals outside on the ground (where they have direct contact with the earth), but if this is not possible, a windowsill is also acceptable. WANING MOONLIGHT: Place your crystal outdoors or on the windowsill and leave it in the moonlight for one full day (24 hours). This method of charging will help you to release unwanted energies. It is connected with the water element. It is preferable to place crystals outside on the ground (where they have direct contact with the earth), but if this is not possible, a windowsill is also acceptable. with the earth), but if this is not possible, a windowsill is also acceptable. FULL MOONLIGHT: Place your crystal outdoors or on the windowsill and leave it in the moonlight for one full day (24 hours) or for one full moon cycle. This method of charging is connected with abundance and wholeness and with the water element. This method works particularly for feminine-energy stones. It is preferable to place crystals outside on the ground (where they have direct contact with the earth), but if this is not possible, a windowsill is also acceptable. DARK MOONLIGHT: Place your crystal outdoors or on the windowsill and leave it in the moonlight for one full day (24 hours) or for one full moon cycle. This method of charging is connected with self-reflection and introspection and with the water element. This method works particularly for feminine-energy stones. It is preferable to place crystals outside on the ground (where they have direct contact with the earth), but if this is not possible, a windowsill is also acceptable. WINTER SOLSTICE: Place your crystal outdoors or on the windowsill and leave it in the moonlight for one full day (24 hours). This method of charging is connected with rebirth and renewal and with the air element. It is preferable to place crystals outside on the ground (where they have direct contact with the earth), but if this is not possible, a windowsill is also acceptable. SPRING EQUINOX: Place your crystal outdoors or on the windowsill and leave it in the moonlight for one full day (24 hours). This method of charging is connected with growth and joy and with the earth element. It is preferable to place crystals outside on the ground (where they have direct contact with the earth), but if this is not possible, a windowsill is also acceptable. SUMMER SOLSTICE: Place your crystal outdoors or on the windowsill and leave it in the moonlight for one full day (24 hours). This method of charging is connected with personal power and intensity and with the fire element. It is preferable to place crystals outside on the ground (where they have direct contact with the earth), but if this is not possible, a windowsill is also acceptable. FALL EQUINOX: Place your crystal outdoors or on the windowsill and leave it in the moonlight for one full day (24 hours). This method of charging is connected with abundance and intuition and with the earth element. It is preferable to place crystals outside on the ground (where they have direct contact with the earth), but if this is not possible, a windowsill is also acceptable. SUNLIGHT: Place your crystal outdoors or on the windowsill and leave it in the sun for one full day. This method of charging is connected with personal power, good luck, and vitality and with the sun element. This method works particularly well for masculine-energy stones. It is preferable to place crystals outside on the ground (where they have direct contact with the earth), but if this is not possible, a windowsill is also acceptable. RIVERS & LAKES: Hold your crystal in a stream or lake for approximately five minutes (or until you intuitively feel is has been charged). This method of charging is connected with the emotions and the water element. THUNDER STORMS: Place your crystal outdoors or on the windowsill and leave it in there for one full day (24 hours). This method of charging is connected with excitement, renewal, balance, and new energy and with the element of spirit. It is preferable to place crystals outside on the ground (where they have direct contact with the earth), but if this is not possible, a windowsill is also acceptable. FOG: Place your crystal outdoors or on the windowsill and leave overnight. This method of charging is connected with protection and for deciphering hidden messages. It is preferable to place crystals outside on the ground (where they have direct contact with the earth), but if this is not possible, a windowsill is also acceptable. PYRAMIDS: Place your crystal within or beneath any pyramid-shaped object for one full day (24 hours). This method of charging is connected with preservation and protection and with the element of spirit. SACRED SPACE: Keeping your stone in a sacred space (some place sacred to you or to your spiritual beliefs) is a wonderful way to charge it with that energy. QUARTZ CHARGING GRID: Create a circle of Quartz crystals with their points facing inward and place your stone in the center of the charging circle. Join in and write your own page! It's easy to do. How? Simply click here to return to Crystals.